You did a fabulous job, Jane. Your freesias are beautiful!! Thank you, Shevaun – especially for all the support and encouragement you have given me. I appreciate it very much. The fragrance of freesia fairly oozes from the painting. Absolutely wonderful!!! Thank you, Sandy – they are one of my favourite flowers, and I really enjoyed painting them! This painting is wonderful, its such a nice feeling when you make sure you find time to paint. I’ve used the line ‘I just don’t have the time’ more often than I care to remember and I think you can always ‘make time’ if it’s something you really want to do. Please keep painting! Best wishes. Helen. – P.S. If you don’t mind me asking… What freelance work are you doing? And how do you go about it? I am ashamed to say that I have only just found your comment on my blog. Not sure how I missed it before, but thought I would reply anyway. I love your work! The struggle to find time to paint goes on, but I have made some progress. It helped a lot when I started giving classes and workshops in my local area – it’s not just about me inspiring the students: they constantly challenge and inspire me as well. You asked about my freelance work – I have been designing books for over 30 years, and it remains a useful source of income that helps when painting sales are slow. Only problem is that it can sometimes be very time-consuming, so I have been trying to pick and choose clients more carefully than I would have done some years ago. As far as how I go about it – it’s almost all word-of-mouth at this stage, and repeat customers. 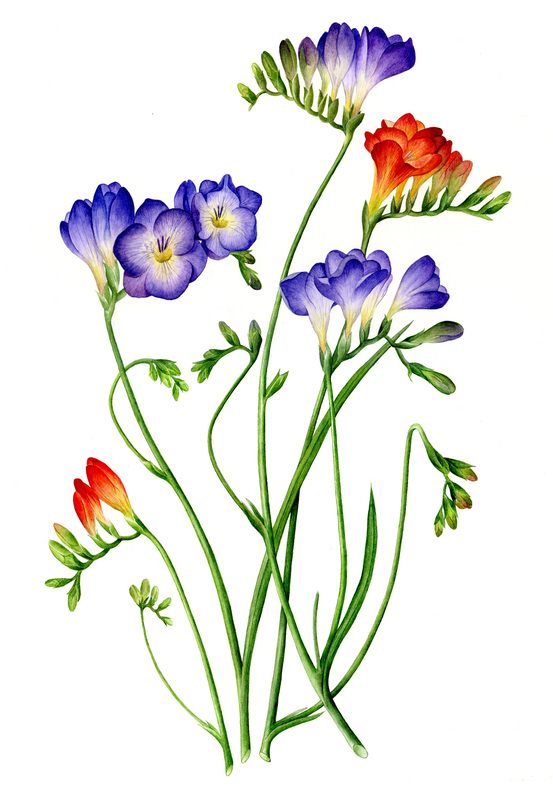 Actually, since I started tutoring in botanical art I am less reliant on book design work. I have just been asked to tutor a 5-day beginner’s botanical art course at the Burren College of Art next May. I feel honnoured to have been asked, and the thought of being able to spend a week in one of the most beautiful places in Ireland at the height of the spring flowering season (the Burren is an area of limestone pavement in the west of Ireland, which has an exceptional flora), with nothing to do but concentrate on botanical art is my idea of heaven! Apologies for taking so long to reply. All the best with your own painting. Thank you, Amos – and apologies for not getting back to you sooner. I’m very happy that you like my website – and please do come back again. I will try to post a little more often!